Floyd Landis rolled out key elements of his defense against doping charges in an online presentation Thursday, several months before the cyclist is scheduled to present his case to an arbitration panel in hopes of keeping his Tour de France title. Early Thursday, Landis posted a PowerPoint presentation prepared by Arnie Baker, a retired doctor and longtime coach and adviser, as well as several hundred pages of documents related to the charges on his Web site, www.floydlandis.com. 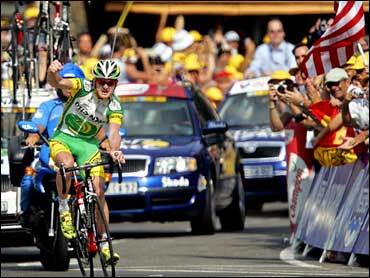 Landis has said he wants to race and compete in the Tour de France again. The problem, for now, is that he was fired by his Swiss team, Phonak. He believes he will have a team again if he can prove the elevated testosterone test was faulty. In an interview with CBS News's The Early Show last week Landis said, "Now I'm even more motivated to prove to them that I didn't (use performance enhancing drugs), first of all, and after that, to go and win the race so I can have a proper celebration. "I think when everyone gets to see that I was innocent and am innocent, that they'll want to celebrate with me," he added. The presentation highlights a number of inconsistencies in both the paperwork and the results provided by the French lab that reported elevated ratios of testosterone to epitestosterone in both Landis' "A" and "B" samples, as well as the presence of synthetic testosterone. Those inconsistencies were part of a motion that the cyclist's attorney, Howard Jacobs, submitted to a U.S. Anti-Doping Agency review board seeking to have the case dismissed. That request was denied last month. Landis, a native of Lancaster County, Pa., is scheduled to present his formal appeal to a panel from the American Arbitration Society sometime in late January or early February. He could also appeal to the Swiss-based Court of Arbitration for Sport. Tour de France organizers have already said they no longer consider Landis the champion, elevating second-place finisher Oscar Pereiro instead. They also planned to begin proceedings to formally strip Landis' title when the appeals process is exhausted. Landis' positive test results were reported less than a week after his triumphant July 23 ride into Paris. In the days following the report, Landis contended that a number of factors could have triggered the result — thyroid medication, cortisone injections he was taking for a damaged hip, his body's tendency to produce too much testosterone, even some whiskey he drank the night before his stirring win in Stage 17.